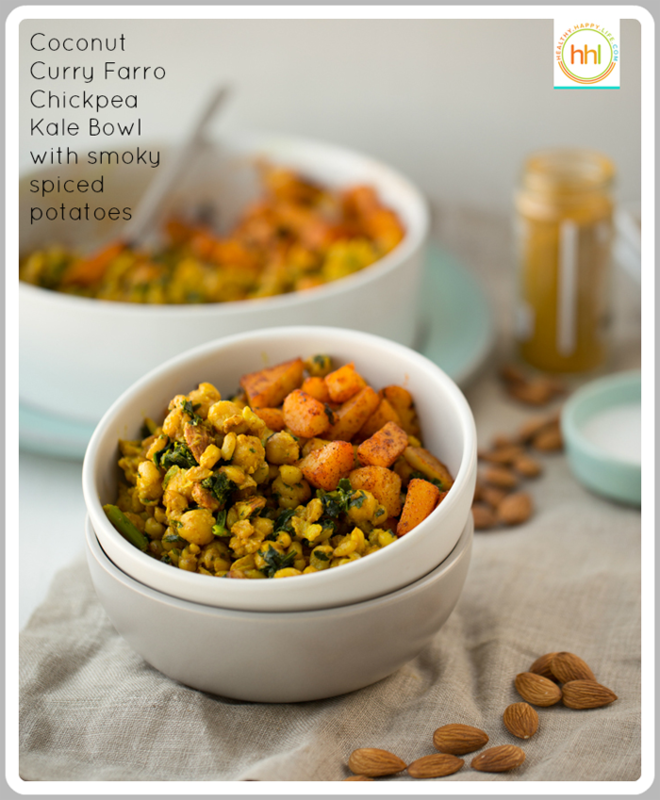 This one bowl wonder vegan meal, served from a sizzling, steamy, skillet, is ready for you! 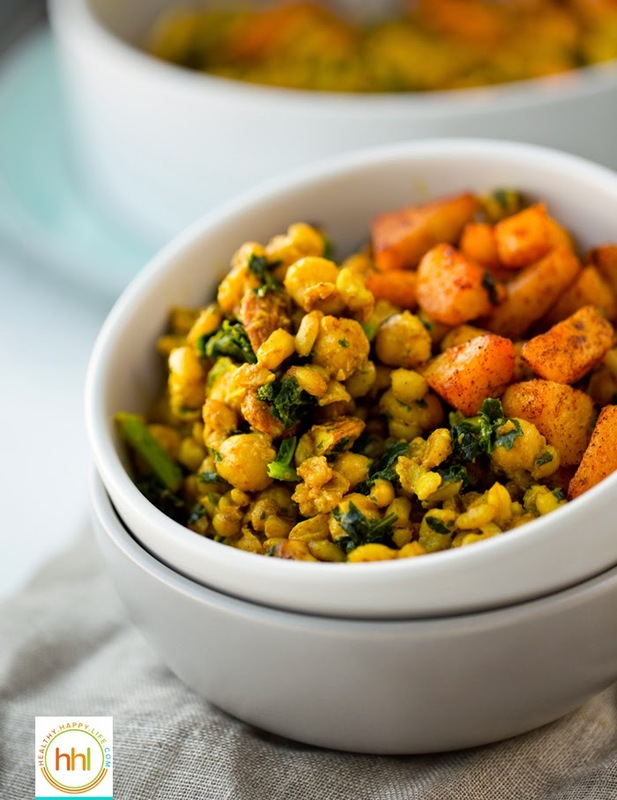 Each warm bite is rich in mysteriously alluring curry flavor. 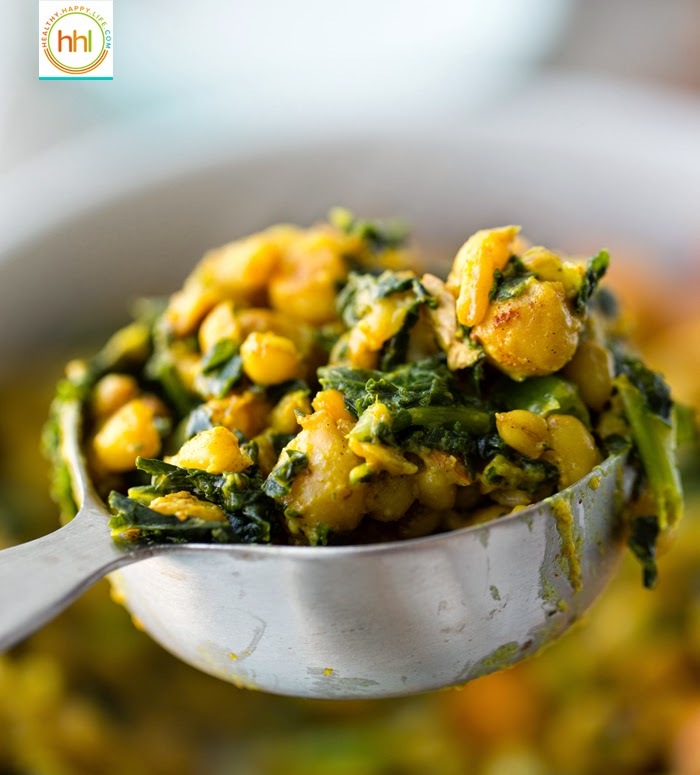 Your senses will perk up and get excited while you are cooking this meal! 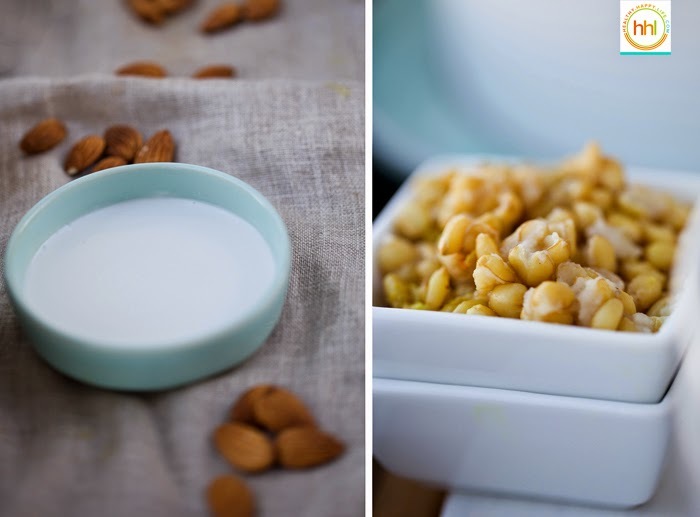 This entree is soothing and nutty yet spicy with a hint of luxurious sweetness from coconut milk and candied almonds. Not to mention that this is a super healthy meal, rich in whole grains, nutritious beans, nuts and veggies like kale and potatoes. Are you craving it yet? I hope so! 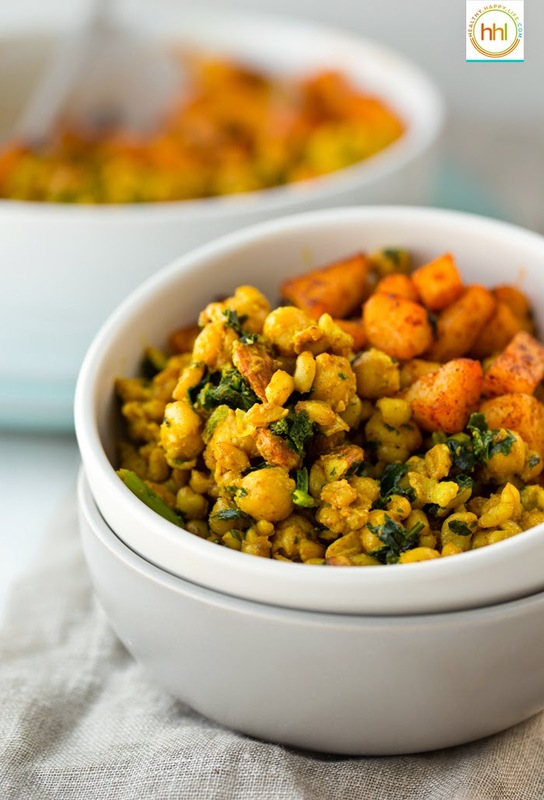 Put my Coconut Curried Skillet Farro and Chickpeas with Smoky Potatoes on your menu this week!.. One of my best meal prep tips is to make a BIG batch of grains like brown rice or farro and serve it for the next few days in various recipes. 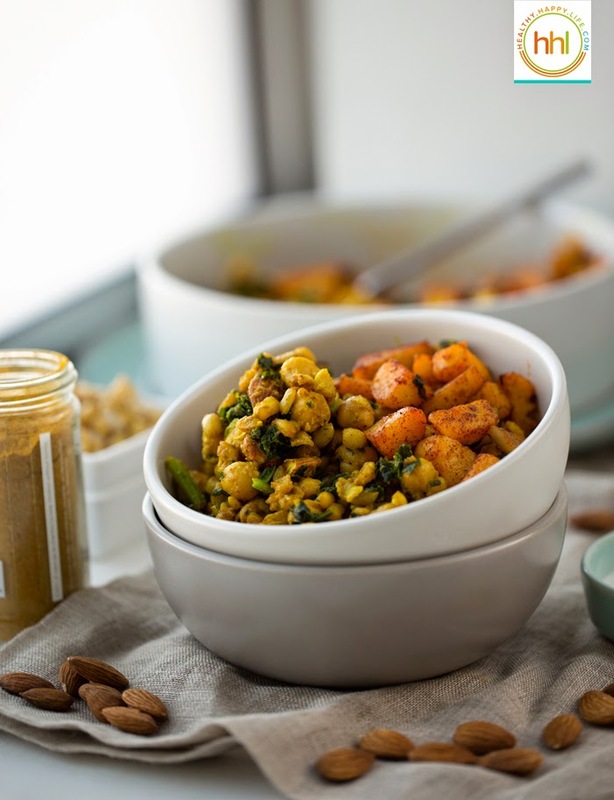 Use grains for breakfast bowls, added to salads and soups, or cooked up in a sizzling stir fry. Kinda like this skillet featuring farro.. This dish is delicious served steamy hot or chilled straight from the fridge. I tasted it both ways and though the hot bowl was super comforting and cozy, the butteriness and hearty texture once this mixture was chilled was also very inviting. If you want to serve this mixture in a different way, add it to a giant tortilla or lavash wrap or pita pocket along with some leafy greens for a wrap or sandwich style meal. 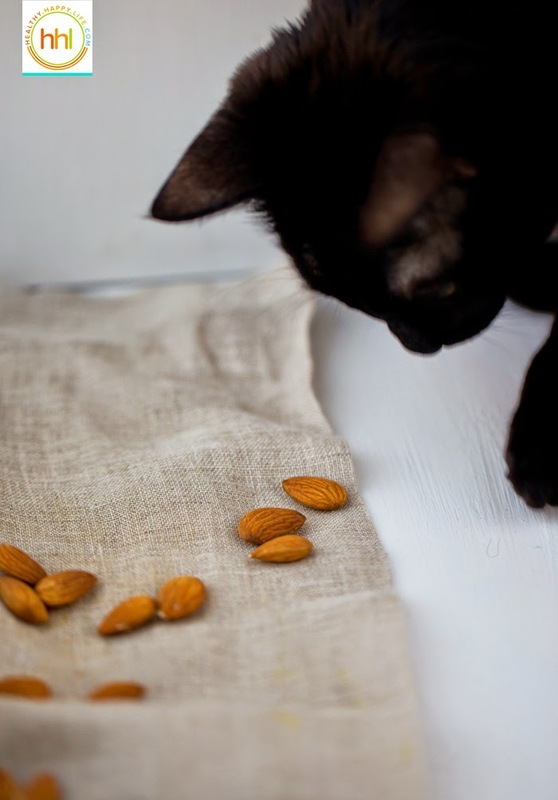 Mr.White was curious about these almonds, I mean anything to bat at for no reason is a toy, right? Don't worry I didn't let him try to eat one. All that goodness in one steamy delicious bowl. 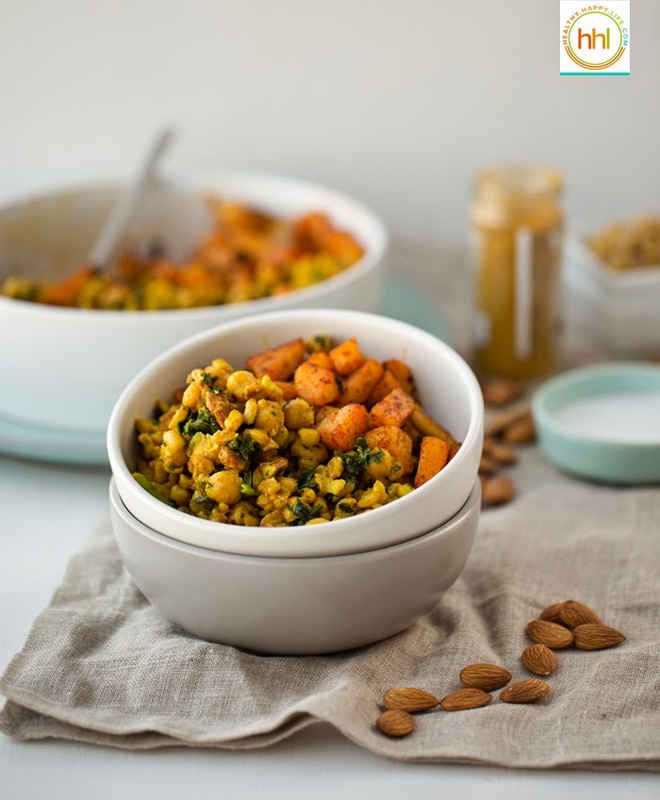 Warmly spiced, loaded with hearty ingredients and captivating flavors of curry, cinnamon, coconut, almond and greens. This grain and bean dish is entree approved and a one bowl wonder meal. Load up a bowl and sink into deliciousness. Precook your farro, since this will take a good hour to get your farro tender you may want to do this part the day before like I did, so when you are ready for dinner, you can whip up this dish in under thirty minutes, easy! Cook farro by boiling it in a large pot of water until all the water has absorbed and farro has bloomed and is tender. I usually slowly simmer my farro in water for at least 60 minutes. Drain any excess water and place cooked farro in the fridge to chill. To prepare farro: Warm a skillet over high heat and melt the vegan butter. Add the cooked farro, curry and cinnamon and sautè over high for about two minutes. To the farro, add in the chickpeas and coconut milk, optional citrus ingredient and fold. Fold and sautè for another few miutes until the coconut milk has absorbed. Then push all the farro mixture over to one side of the pan leaving a blank space. Add the chopped almonds to the blank spot and drizzle the maple over top them. Stir the maple almonds for a minute, then fold them into the rest of the mixture. Reduce heat to low and fold in the kale and parsley and optional orange zest. 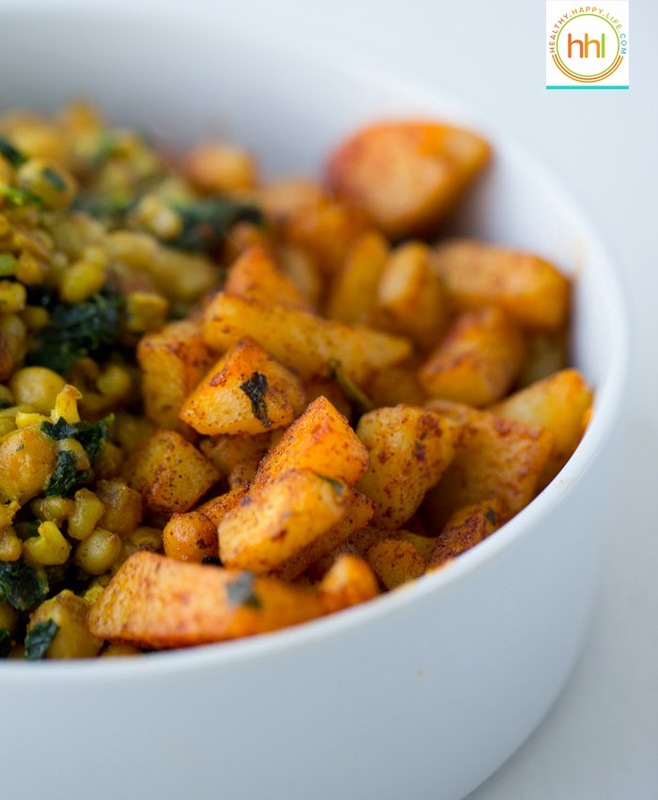 While the farro mixture is on low heat, bring a small pot of water to a boil and boil the potatoes for 4-6 minutes or until tender but not mushy. Drain potatoes and set aside. 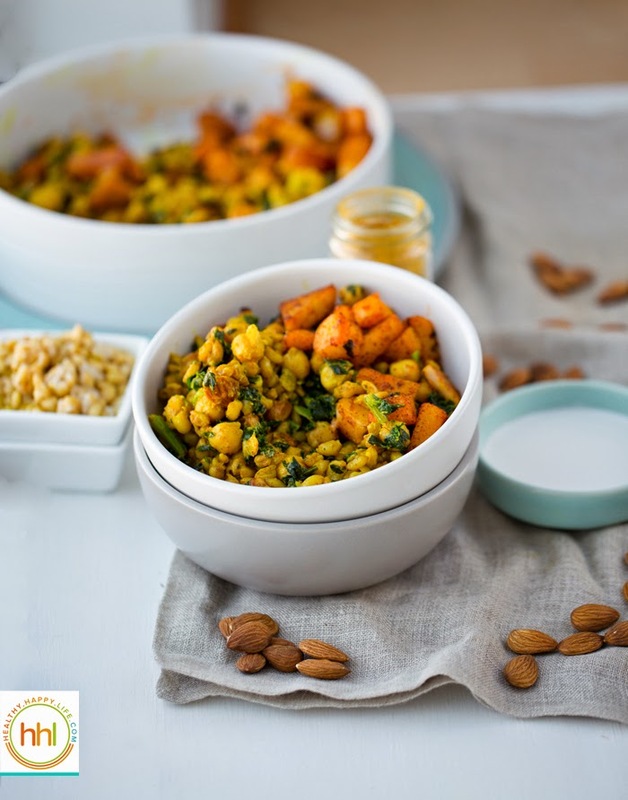 Transfer the farro mixture to your serving bowl, and in the same skillet, turn up stove heat to high and melt the coconut oil into the skillet. Add the potatoes, paprika and salt and pepper. Saute potatoes 3-4 minutes, or until edges brown and crisp up. Pour potatoes on the side of the farro in the serving dish to serve. Serve warm. Delicious warm or chilled.